Advertising revenue across the Asia Pacific region is expected to grow by 6.2% this year reaching about US$195 billion. 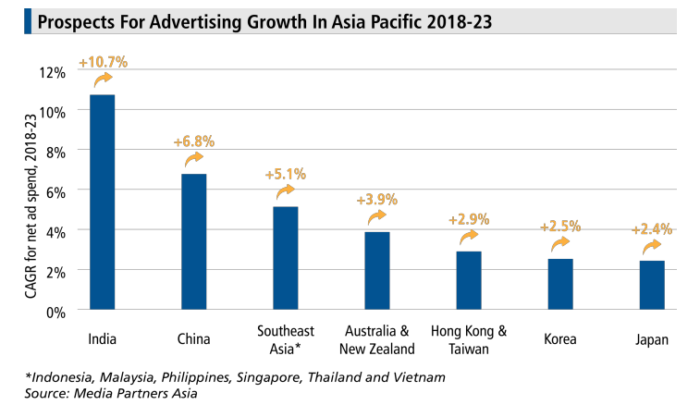 The regions key markets for ad growth between 2018 to 2023 are Indonesia (5.6%), the Philippines (7.5%), Vietnam (8.8%) and India (10.7%), according to a report by Media Partners Asia (MPA). In particular, Indonesia will see a 7.6% growth in net ad spend due to elections and digital growth, while Thailand is expected to see a 5.3% growth. Meanwhile, the Philippines is predicted to have the fastest ad growth in Asia Pacific (15.2%). Despite a significant slowdown, MPA’s report said China will still remain the biggest driver of advertising growth in Asia Pacific, accounting for 65% of new ad dollars between 2018 to 2023. India (11%) is listed as the second largest contributor followed by Japan (10%) and Australia (5%). In the meantime, online advertising remains a main engine of growth and is projected to jump 13.5% this year to approximately US$97 billion. Between 2018 to 2023, digital ad spend is expected to be in the 50% to 70% range in Malaysia, Taiwan and Australia; between 40% to 50% in Singapore, Hong Kong, Vietnam, Japan and South Korea; and approximately 30% to 50% in Indonesia, Thailand and India. Despite tighter regulations around online advertising in China, the online ad market will still grow by 14.4% between 2018 to 2023. Also, mobile remains the largest contributor driven by in-feed advertising in popular apps such as WeChat. Online video advertising, which is mainly dominated by YouTube outside of China, increased by 29% across Asia Pacific last year to reach US$12.4 billion, forming 15% of all online advertising. This segment is expected to grow to 20% across the region by 2023, representing US$27 billion in spend. MPA executive director Vivek Couto said the general outlook remains “positive”, buoyed by steady growth across almost all markets over 2019 and 2020. 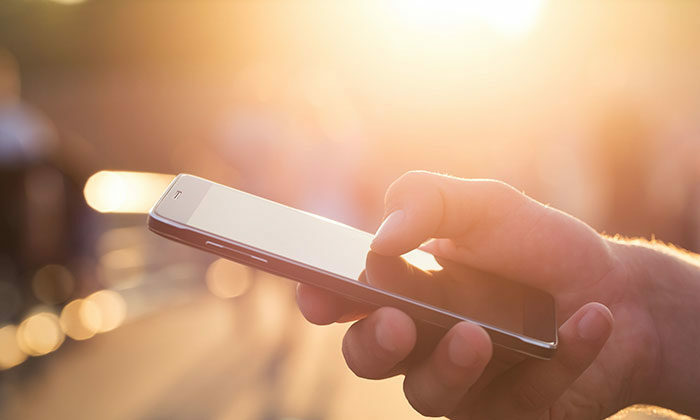 Additionally, elections in Indonesia, the Philippines, Thailand and India will “further boost” ad prospects in 2019, while India will also benefit from marquee cricket. Couto added that TV remains an advertising mainstay in India, even as affordable high-speed broadband and a strong start-up economy drive advertising in tandem, especially online video. According to him, China’s ad market slowed from 10.3% growth in 2017 to 7.8% last year amidst macro issues. Nonetheless, Couto said China’s ad market has a “reasonably robust” future, with an estimated 10% for online advertising between 2018 to 2023. “TV advertising meanwhile remains important but is under pressure from online video and near-term macro headwinds, especially in Australia, Indonesia, Japan, Korea and Thailand. TV advertising across Asia Pacific contracted by 1.9% in 2018 and will be down by 1.4% in 2019, according to MPA forecasts,” he said. Couto added that at the same time, broadcasters in a number of markets – most notably Australia, Hong Kong, India, Japan and Korea – are gaining share in online video advertising with their own branded AVOD platforms. Shifting dynamics in TV and online are likely to force more consolidation and M&A in Indonesia, Korea and Thailand in particular, as well as other markets in Southeast Asia. Malaysia Airlines’ head of loyalty, Khairul Nisa Ismail said Greater China has always been the favourite destination for its loyal..